Meet your customer’s emotional needs and they will buy from you. Sales closing techniques that use impulse and emotional selling techniques are often overlooked by small businesses and self employed people selling their own services. Later we’ll look at benefits you can present to your customers. But first, what benefits do you want fro your sales role? Job security from your sales results. Or perhaps you're looking for career development. Then closing sales with emotional and impulse selling techniques could be the sales training that will give you the benefits that you want. To decide if emotional and impulse sales will work to close your sales, consider the following questions about your small business sales. Do people buy your products because of their emotions or by using logical thinking? Is it a pure impulse sale, like clothes shopping and spending more than you can afford on that great outfit, or buying a dream holiday because of how the brochures make you feel. Will the bottom line benefit of your product create feelings in your customer? This could be safety, pride, achievement, progress, a good decision, security, attachment, and many other emotional based feelings. Or do you sell a more technical product or service for which the customer uses logic to make a buying a decision. I’ve worked with sales people in the waste collection industry where it’s hard to make emotional sales closing techniques work. The buyer uses logic to compare suppliers and measure costs. Many small business sales operations sell products and services that can be sold using emotional sales motivators. Then consolidate the sale by logical persuasion. A good example of this type of sale is automobile sales. The buyer usually agrees a sale because of emotion and feeling, and then justifies their decision to themselves with logic. The sales closing techniques, and the sales process, first uses impulse and emotion selling techniques to targets the emotions with the look of the shiny new car, the feel from driving it, and that new car smell. Then benefits are used to make buying the car appear a good, logical, decision. These are benefits such as fuel economy, safety, added extra’s, or finance arrangements. Closing a sale with emotion selling and impulse persuasion is done throughout the sales process. You find emotions and impulses that the buyer is looking for during the questioning stage and present them back in your sales presentation. When using impulse and emotional sales techniques always use a process, and weave your closing techniques into that sales process. If you don’t fully understand how to use a sales process open the link and learn, it’s essential for all small business sales. To close a sale with emotional closing techniques, use those benefits that hit the emotions and impulse targets. The sales presentation you make should be focused on the benefits the buyer has told you they want during the questioning stage of the sales process. You can learn more about Sales Questioning Techniques by clicking the link. Pay attention to what they have told you about the emotional benefits they want from your product. How do they want to feel, how will the product make them look, are they wanting others to admire or envy what they buy. What about negative emotional sales closing. Listen for what they don’t want. Sales training for financial planning or insurance sales covers negative emotions. They don’t want their family to suffer, not have enough money if something happens, or fear of struggling in their old age. Take those emotional wants, desires, and needs, from the answers to your sales questions, and use them in your sales presentation. If they wanted envy from others, give it to them. Tell them how others will feel when they see them in that new car, new outfit, or when the home improvements are complete. The emotional sales closing techniques are just as effective when selling to business customers, as long as that’s appropriate for your product and your small business marketing plan. Find the emotional keys with great sales questions and then present how you can match those needs in your sales presentation. Find out what the ultimate objective of the purchase is, the bottom line. Look for the benefit they want from a good buying decision. Saving money is not a bottom line benefit. What the customer does with the savings is the ultimate benefit, and when closing the sale with your sales presentation that’s what you want to present. Focus your presentation on emotional benefits, not the features of the product or service. To see how to do this to great effect open Sales Presentation Tips and start making emotional sales presentations that touch the buyer’s impulses. I said earlier that I’ve worked with sales teams in the waste collection industry. Even there we used emotions to close the sale. If a site manager said service was important to them, we would find out why. What it was that a good service from a waste company would give them. It could be time, because they didn’t want to have to spend time chasing missed collections. Safety, because there was food waste in the containers and regular collections kept vermin invasion down. Pride, because they were being seen to do a good job and make smart choices. Include the emotion targeted benefits in your sales presentation. Follow the sales process of presenting the benefits, gaining agreement that you have met the buyer’s needs, and then closing the sale. The real closing goes on in the presentation stage of the sale. The more competent you become at matching the buyer’s emotional needs, wants, and desires, to your product features, then the benefits those features provide the easier it is to close the sale. Once you have gone as far as you can with the emotion targeted benefits, you can use logical sales closing techniques to consolidate the sale. This is where you help the buyer convince themselves that that impulse purchase was really a well thought out decision. This is where you use price comparisons, service guarantees, longevity of the product, feedback from other customers, or details about the product. They have already made the emotional decision to buy, now you just need to close the sale by giving them a logical reason to commit. 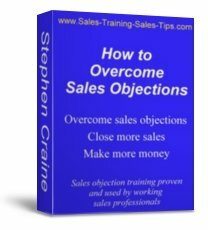 If you would like to see the sales training I present to my working sales teams open How to Close a Sale and make a real difference to your sales results today. With the sales training Blog and the Free Newsletter we call The Sales Buzz you can make sure you get all the updates to this site and never miss what could be important sales training that you could use. To get the Blog click the buttons headed subscribe to this site under the navigation bar. For the free newsletter add your email address to the box on the left below the navigation bar or click Free Sales Training Newsletter. 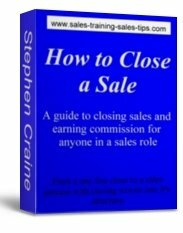 To see more sales skills training you can leave sales closing techniques and open the sales skills main page. You can start a new search for more sales techniques and sales skills by opening the Sales Training Sales Tips home page.